Modern Vintage Cupcakes and Mercury – Handmade Fashion both egged me on to reveal my stash. Having thoroughly enjoyed peeping into their stashes, how can I refuse. So here goes. 1. How long have you been sewing and stashing? How big is your stash? I started sewing probably in Junior High School. That’s like almost 3 decades ago! But there were some big gaps in my sewing history – if not in stashing. As for size of my stash, now here are some scary stats: Current count – 264 pieces of fabrics, 753 yards (including linings, excluding interfacings). 2. Where do you keep your stash? How do you store it? Most are in my bedroom now. My sewing room isn’t big enough for stashing & sewing. One trunk has escaped into the living room. A few boxes remain in the sewing room with a few more pieces hanging in the closet. New arrivals hang about anywhere while awaiting processing. As you can see I box up most of my fabric. That’s because I have a moth problem. 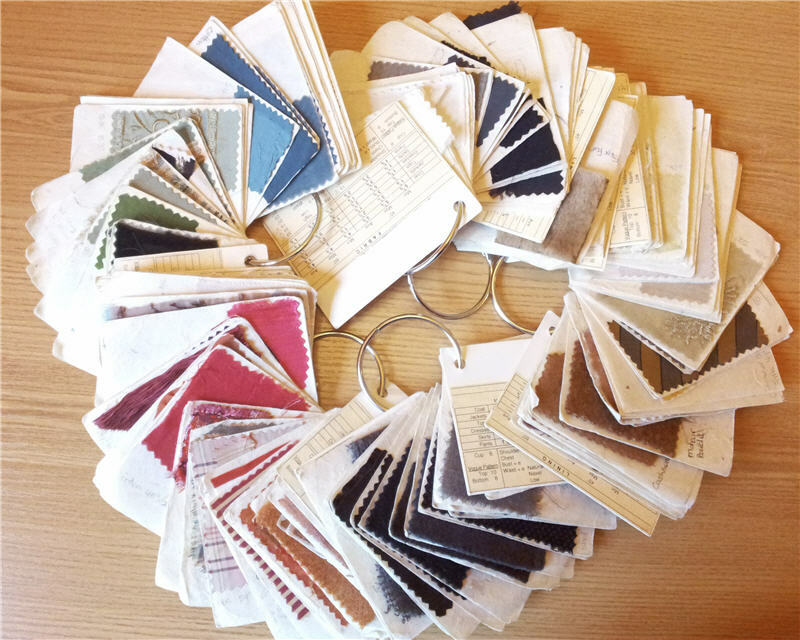 I started out with opaque boxes and swatch cards to keep track of the fabrics. But given how easy it is to forget what I have – out of sight out of mind & all, I’ve started swapping to clear plastic boxes. I do try to group similar types of fabrics together, sometimes even similar colors when I have multiples – easily done when you don’t remember what you already have when you go fabric shopping yet again! 3. What is the oldest piece in your stash? What was your original plan for this piece and why hasn’t it happened? Oldest might be this lovely silky floral print I inherited from my Mom. It’s gorgeous. But there is only 1-3/8 yards of this 38″ fabric. So I’ve been quite indecisive about what to make with it. Of the fabrics I bought myself, I have absolutely no idea! I don’t think I have any left from Junior High, but I’m pretty sure there are a few from High School. Like this seersucker, which I tried to dye a long time ago and end up with a slightly hippie tie-dye effect. Like most fabrics I buy, I didn’t have a specific plan for it. I get many ideas along the way, but again commitment phobia kicks in time and again. 4. What’s your favorite piece in your stash? Where did you get it, what do you love about it, what do you think you might do with it? OMG – you can’t make me choose! I love them all! Well, almost all. Each one is full of possibilities…until you sew it up! 5. Does the fabric you buy go straight into hiding or do you wash it first? They first incubate and collect dust while I find them a hiding place. As you can see my main stashing area is bursting at the seams. It takes a while to find a home for new-comers. I do try to wash them ASAP. But…I hate doing laundry, so you can imagine how long my good intention last. Especially the fancy silk and wools (and any specialty fiber). P.I.M.A. So I’ve resorted to a spreadsheet to keep track of what I have and what’s ready to rock-n-roll. 6. How do you add to your stash? Do you buy with a purpose in mind, or is it fabric lust? LUST. Period. Especially off-line. NYC fabric stores are especially lethal for me. I can pawn my Other Half’s apartment to spend it all in them damn stores. OK, there might be a few pieces bought to copy some lovelies from clippings. But once they’re in the stash I start having other ideas. 7. Do you have something in your stash that you cannot bear to cut into? Why? Almost all of them? If I must choose, then maybe these silkies. I mean, that says it all. Heavenly. Expensive. Limited quantity. Slippery. Will my design, fitting & sewing skills ever do them justice? Note how I’ve even bought a pair of shoes just to match one of these fabrics. I guess those shoes will never be worn either. 8. Do you just stash fabric, or does the problem include patterns and notions? Patterns again look rather contained, partly due to clipping and increasingly more magazines than traditional Big 4 patterns. Oh, and some digital ones. But I only discovered the magazines not so long ago, so I’m sure this pile will grow over time. So far so tame. But lurking in every corners are actually mini-stashes of all sorts. None enough by themselves to warrant notice. But add them all up and you got the Other Half complaining you’re taking up the whole apartment! Salvaged bits for making bags and hats. I gave up on the ideas of making my own shoes. Couture flourish finishing school – aka embroidery kits & bobs. Let’s not forget UFOs & RTW awaiting upcycling (2+ boxes in my main stash area). Or the scraps that my Plastic Daughters have laid claim to – having had their big heads filled with fanciful ideas from doll mooks (magazine-books) I foolishly bought them. Even retired lace undies & stockings with runs have not escaped their greedy little hands. 9. Have you decided to do a “stash-busting” resolution this year? If so, what have you decided to do? I dare not. That’d be tempting Fate. Especially as the Other Half had already suggested going to NYC for holiday this year. That’s any resolution busted already. I just need to keep my head down, tackle one project at a time. And get a handful of TNT patterns sorted. Yeap, I think TNTs will be my stash-busting super-heroines! Plus I have 3 bins of fabric and 1 of patterns at my mom’s house, where i am temporarily….. If you have over 700 yards of fabric, I’m scared to estimate on what I have. I have a 12 X 30 ft storage and half of it is boxes of fabrics! 3 army sized filing cabinets and about 6 plastic bins of patterns!!! Oh me…..
LOL. How did you end up with so much? Wow, that is some stash! I have to confess I am in awe of your organisational skills – a fabric spreadsheet?? Genius! 😀 Thanks for letting us have a peek!